Complete bigger jobs even if you don't have the biggest budget. Create your own path to productivity with the Lanier MP 7503 Black and White Laser Multifunction Printer (MFP). Built with our Workstyle Innovation Technology, you can accomplish more high-volume tasks with less effort via customizable digital workflows, cloud-based accessibility, support for mobile users and more. 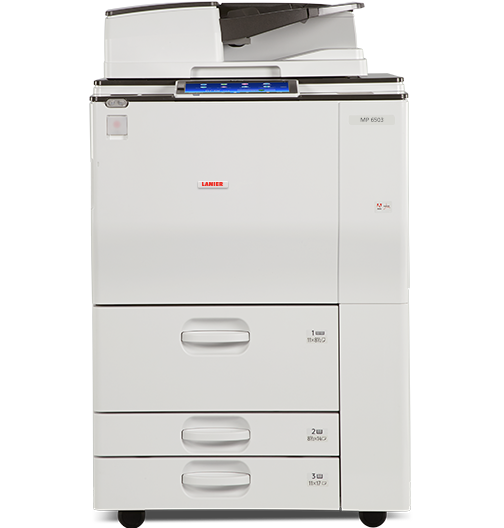 Simplify how you work by printing, copying, scanning and faxing from the MP 7503. Use it to print black-and-white output on a wide range of paper stocks at up to 75 pages per minute (ppm) with resolutions up to 1200 x 1200 dpi. Scan full-color originals and distribute them immediately with a host of Scan-to capabilities. Deliver incoming faxes directly into your email for fast, inexpensive paperless collaboration. Change the way you work. The large 10.1" Wide Smart Operation Panel replaces hard keys with touchscreen precision. With the same movements you use on your smartphone, you can slide from one job to the next, download information-rich widgets, check settings and more with a single swipe, pinch, flick or drag. An embedded web browser makes it easy to access the internet and take advantage of powerful scanning and cloud services including Ricoh DocumentMall and Syncplicity Enterprise File Sync & Share. Create customized shortcuts to frequently used tasks and skip time-consuming manual steps. Connect directly to print, copy, fax and scan functions with a single touch. Find information just as easily. Use optical character recognition (OCR) on your scanned files to make them keyword-searchable. For even greater productivity, add Ricoh Streamline NX, Nuance® AutoStore® or other Brand and third-party workflow software. Make sure that your information remains secure. Restrict access to the MFP to authorized users only. Have them sign in via passcode, or billing code on the control panel or by swiping an identity card with the optional NFC card reader. Track every action and assign chargebacks when you pair it with optional accounting software, including Ricoh Device Manager NX Accounting. Set print quotas to curb excessive printing for specific users or departments. Print on the move without utilities, software or drivers. Download the RICOH Smart Device Connector app to control print, copy, scan and fax functions directly from your smartphone or tablet. Access the information you need from the device or from your choice of cloud applications. You can also send digital files to contacts in your personal address book and bypass the network entirely.